If I see a bear by the side of the road, find a legal pull-out, get out of my car and watch, and then a Bear Jam forms, is that my fault? Usually, the way bear jams or deer jams form, is that one person notices the animals. Drawn by their attention, a group begins to gather. Motorists slow down to see what they are looking at. 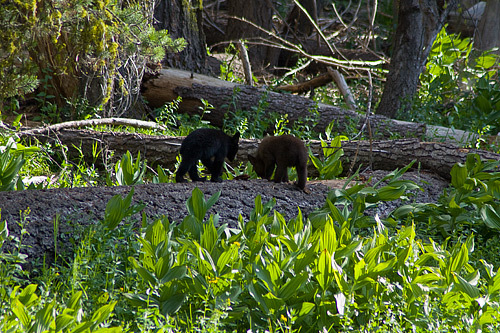 When that something is a bear – or in this case, a momma bear and two absolutely adorable cubs – crowds form, traffic slows, and before you know it – Bear Jam. I have proven over and over, that I am EXACTLY the sort of person that stops in the middle of the road in order to get a better look at some cool animal. Tom and I came to a full halt in the middle of the road in Australia to watch an Echidna uncurl and then complete it’s wobbling deliberate journey across the road. I’ve stopped mid-drive for bear, coyotes, even a couple of road-side flowers. Sometimes, you just have to stop. However, I do at least try to be reasonably considerate about it. I am more than aware that not everyone on the road has the same inclination to come to a complete mesmerized halt at the very same moment that I do. After all, most of the time the person that isn’t interested in the thing by the road, or actually has someplace to be, is me. Besides, coming to a complete stop in the middle of the road just around a blind corner is freaking dangerous. Most recently, Tom and I were caravanning two cars back to our house when I looked over and spotted a bear. Tom had seen her too, and we pulled over in the nearest pull-out, grabbed our camera and binoculars and walked back up the street. It wasn’t long before a giant crowd formed. Some people just stopped in the road. Others, with more consideration tried, unsuccessfully, to pull mostly off the street before jumping out to take pictures. Before long, a resigned-looking ranger appeared, trying to clear the traffic, keep half an eye on people creeping down into the meadow to take a closer look, and get the illegally parked cars off the road. I didn’t envy him his job at that moment. 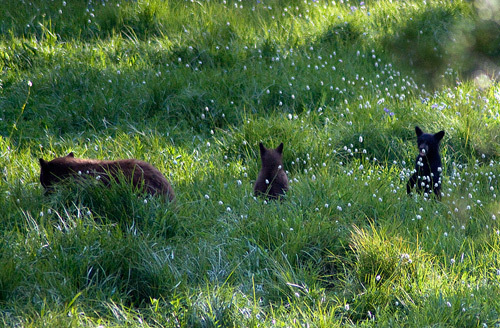 The bears had probably been in the meadow for quite some time. If we hadn’t stopped, maybe no one would have noticed. Maybe the Bear Jam wouldn’t have formed at all. 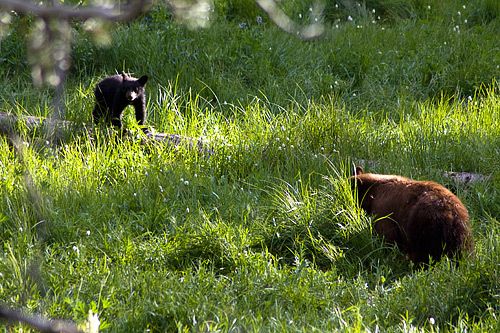 Although I feel a little guilty about that, we did get some nice pictures – and a chance to watch some really beautiful bears doing wild bear things. You should only feel guilty if you stop at some random spot along the road and pretend to be watching a bear in order to cause a Bear Jam. I’m so glad to know I’m not the only one who stops for wildflowers. Elizabeth stops for views of the Earth’s curvature. Memorial Day we were in the other kind of Bear Jam. Stuck in traffic below the Sentinel for over an hour, and out of the woods ambles a bear. It just wanted to watch us, I’m sure. Hi Doug. Hehe. I know someone who not only stopped for no reason, but actually chose to do it in the middle of an intersection. It helps if you can wave a camera with a big lens around. He was lucky he wasn’t shot by some impatient local. Memorial Day traffic is the worst. Usually we try to plan our activities carefully so that we aren’t on the roads during the busiest part of the day during that weekend. The climbing routes tend to be uncrowded – better to stay on them, and out of your car. Have to say – it was downright accommodating of that bear to provide entertainment while you were stuck, though!